We can think of and as infinitesimal vectors connecting neighboring points in the complex -plane to the point . Likewise, and are infinitesimal vectors connecting the corresponding points in the complex -plane. It is clear, from the previous two equations, that, in the vicinity of , the mapping from the complex -plane to the complex -plane is such that the lengths of and expand or contract by the same factor, and the angle subtended between these two vectors remains the same. (See Figure 6.7.) This type of mapping is termed conformal. Figure 6.7: A conformal map. is shown in Figure 6.9. Figure: The conformal map . Figure: Stream lines of the two-dimensional flow pattern due to a vortex filament at the origin in the presence of two rigid planes at . is shown in Figure 6.10. Figure: Stream lines of the two-dimensional flow pattern due to a line source at , in the presence of two rigid planes at and . 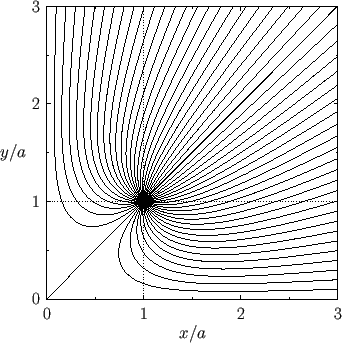 Figure 6.11 shows the streamlines of the flow pattern calculated for . 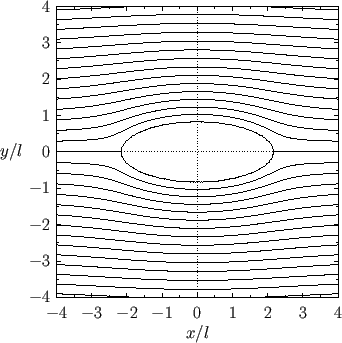 Figure: Stream lines of the two-dimensional flow pattern due to uniform flow parallel to the -axis around an elliptical cylinder.